Most of us take the mains ac supply for granted and use it almost casually without giving the slightest thought to its inherent shortcomings and the danger posed to sophisticated and sensitive electronic instruments/equipments. For ordinary household appliances such as incandencent lamps, tubes, fans, TV and fridge, the mains ac supply does not make much difference, but when used for computers, medical equipments and telecommunicaÂ¬tion systems, a clean, stable interruption free power supply is of the utmost importance. Of the myriad of devices, processes and systems which rely on ac power, computers are probably the most sensitive to power disturbances and failures. Interruptions in powerÂ supply may cause the contents of a memory to be lost or corrupted, the entire system to malfunction or fail, or even variety of components failures to occur, all of which not only result in inconvenience but also loss of money. As more and more PCs, word processors and data terminals find their way into small business, UPS systems that meet the power requirements and price range needs of even the small business organizations and offices are being manufactured. There are three distinct types of uninterÂ­rupted power supplies, namely, (Â£) on-line UPS (ii) off-line UPS, and (Hi) electronic genÂ­erators. In the on-line UPS, whether the mains power is on or off, the battery operated inverter is on all the time and supplies the ac output voltage. When the mains power supply goes off, the UPS will be on only until the battery gets discharged. When the main power resumes, the battery will get charged again. In off-line UPS and electronic generaÂ­tors, ther inverter is off when the mains power is present and the output voltage derived directly from the mains is the same as the mains supply voltage. The inverter turns on only when the mains supply goes off. The ever increasing importance of computers in industry and commerce will increase the need for quality, high stability and interruption free power supplies. A clean ac power source is the fundamental to the operation of most sensitive elecÂ­tronic equipment, and many new and sophisticated circuits are designed to overcome the effects of disturbances normally found in the mains ac supply. In order to protect a sensitive system from power losses and blackouts, an alternative power source is required that can switch into operation immediately when disruption occurs. An interruptible power supply (UPS) is just such an alternative source. A UPS generally consists of a rectifier, battery charger, a battery bank and inverter circuit which converts the commercial ac input into dc suitable for input to the battery bank and the inverter. The rectifier should have its input protected and should be capable of supplying power to the inverter when the commercial supply is either slightly below the normal voltage or slightly above. In case of On-line UPS, the battery operated inverter works continuously whether the mains supply is present or not. Triac T1 is on for all the times while Triac T2 has been provided to bypass the UPS inverter, only when a fault develops in the UPS inverter. When the mains supply fails, the UPS supplies power only until the batteries get disÂ­charged. However, once the mains power resumes, the batteries will get charged again. The switching times of these supplies is considered to be zero. Usually sealed maintenance free batteries are used and the running time of the inverter is low (approximately 10 to 30 minutes). In the case of Off-Line UPS, the inverter is off when the mains power is on and the output voltage is derived directly from the mains. The inverter turns on only when the mains supply fails. Its switching time is less than 5 ms. These UPS are generally used with PCs or computers or other appliances where a small duration (5 ms or less) interrupÂ­tion in power supply can be tolerated. Usually, sealed batteries or lead-acid batteries are used. The running time of these supplies is also low (about 10 to 30 minutes). An electronic generator is the same as the off-line UPS system except for one difference that switching time from the mains supply to battery driven inverter supply will not be small (over 10 ms) for the electronic generator. Also, the electronic generators will run for longer time (1 to 4 hours) than off-line UPS systems because, usually large size lead-acid batteries are used with/electronic generators. These are meant for household applications to run fans, coolers, fridge, lights, TV and VCR. The demand is the highest for the electronic generators meant for house hold applicaÂ­tions, followed by the off-line UPS, and then the on-line UPS systems. The off-line or onÂ­line UPS systems are mainly used in places where PCs or computers are used. The deÂ­mand for on-line UPS systems is less than for off-line UPS systems because the price of the on-line UPS systems is higher. Building the UPS is the easy part, I have yet to find any info on the circuitry needed to tell the computer to power itself down…any help there? can’t there be a resupply of the ups’s output to charge the ups battery so as to maintain a continuous power supply? I am looking for DC/CMOS type circuitry, such as that found in an uninterruptable DC power switch; that would allow me to switch both V+ and ground potentials from two separate 12 VDC continuous type power sources. The load requires as much continuous power as is possible; so that there was no break in power to it. I am thinking that a “stripped down” DC/DC UPS switch circuitry would be the basis for it. Thanks in advance for any circuitry help you can send to me. Your all circuits are much importance for me. would you please send a complete circuit diagram of pwm based ups for home use. please help me. 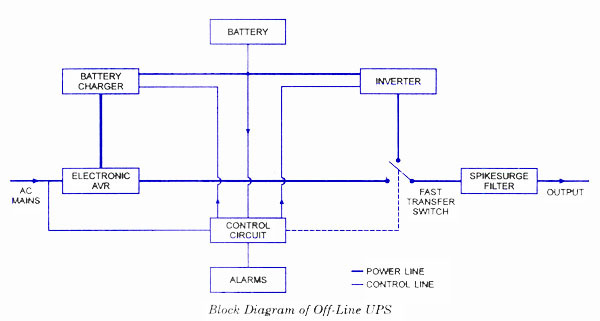 I need 1KVA Offline UPS circuir diagram. Kindly Provide me. Hi, I have a Mustek600 UPS that has been aside for a long time i’ve tried to reuse it but it seem it dosnt work anymore try to recharge it all nigth but it doent work any more is there any recurrent malfunction i can expect? Hi Jackson it is a good idea you can increase AH rating of the battery to increase the operating duration but ensure the whole unit is not getting heated up. If every thing is normal you can use. only problem which we have to take care is the charging current requirement that will be around a maximum of 15Amps, which the UPS built in charger cannot provide, hence you hve to provide a 15.2 volt regulated charger with a current limitting of 15Amp as an external charger. hi, l appreciate your good job. l have an off line 600A ups with me and l wanted to connect a 70ah battery instead of the one existing ( 9ah) for it to support my pc for longer period. can it cause any harm to the inverter system or what do l need to change. thank you. hallow you can use that battery. AH increasing means back up time increase,but you can watch for voltage is sameof both batteries. Any other substitute for this mosfet? MOSFET 85T03GP Not available., Any other substitute for this mosfet? i sale ups of different technologies, like ON-LINE UPS, OFF-LINE UPS, LINE INTERACTIVE UPS. i want to learn how to repair them myself because the technicians don’t give proper time and intention please guide me and let me know, how do i should i take start to learn and the literature which i need to study them or any institute. Hi Mohsin Ejaz you have to increase the invertor transformer capacity and the final drive/out put components to be upgraded with suitable heat sink and protection circuit. it will be a total redesigning of the available circuit, you will be replacing all components except basic oscillator and upto predriver. may not worth the exercise. I have 220 v 100 va sighn wave invertor. How can i increase power of this unit upto 1 kva? Plz send me the circuit of power section UPS. Your all circuits are much importance for me.I need off line ups diagram .which base on SG3524 IC base. Your all circuits are much importance for me. 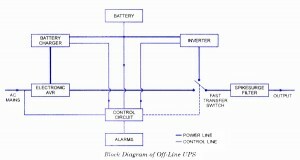 would you please send a complete circuit diagram of pwm based ups for home use.